Anyone who knows me through this blog can probably guess that I’m pretty budgie-obsessed in all facets of my life. This definitely extends to social media. I’m a frequent visitor to several parakeet groups on Facebook, and as a consequence, almost my entire feed is about budgies and other parrots. So, when I glanced at a post one day asking, “do you prefer working out with a budgie, or solo” I prepared myself to write a really thorough response about how Patrick and I have balanced making physical fitness a priority while also not taking anything away from Toby and Kelly. Of course once I actually read the post I realized it was one of my fitness coach friends asking, “do you prefer to work out with a buddy” but since my brain was already churning about the topic I thought I better write up my response here! 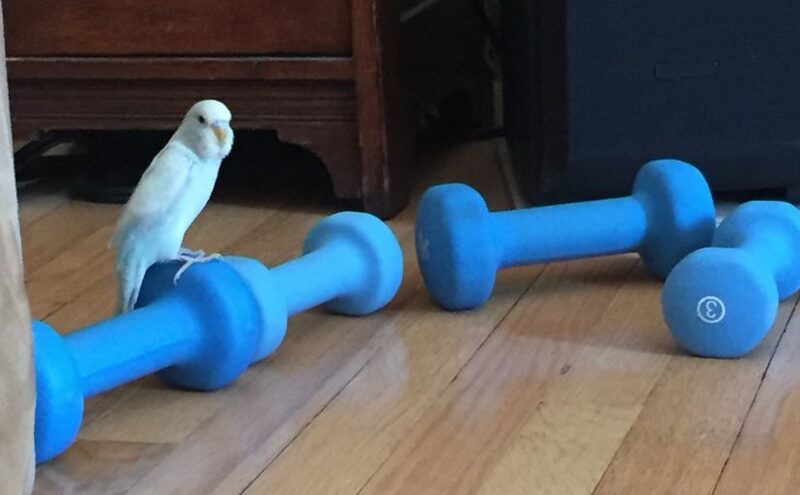 Once budgies take over your life it can be pretty difficult to hit the gym. Unless your budgies have their own room or an aviary, they probably need you to be in the house to have freedom to free fly around and explore. So, hitting the gym for a couple of hours after work would take away time that they could be out getting their exercise. And, let’s be honest, time that you could be spending with them as well. It’s a much better plan, in my opinion, to spend your gym membership money on a few basics for home exercise, and then the rest on budgie gear! Seriously though, you can get a great workout at home, your budgies can be flying around getting their exercise, and who knows, sometimes they may even land on you during a cardio routine and get some extra fitness in trying to hold on while you bounce around. Toby and Kelly used to get a lot of practice clinging when we were in a Leslie Sansone Walking Program phase. I highly recommend Leslie’s videos if you are just starting to workout. They are very low impact and she has a ton of different videos. Also she’s so chatty that even if you’re working out solo you really don’t feel alone. Another good feature of Leslie’s videos is that you don’t need any additional equipment, just a clear space on your floor. 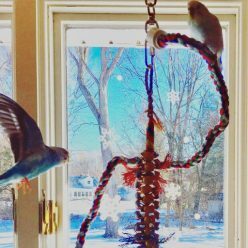 She uses music to keep the pace, which the budgies absolutely love singing along to as well. If you want something a bit more challenging, check out Fitness Blender’s free workout videos. They can also be found on YouTube and not only are there so many you could exercise for years without repeating, they run the gamut from super easy low impact cardio and yoga, to challenging weight training and intense cardio. Fitness Blender is a husband and wife team, which of course appeals to Patrick and me! Again, not too much extra equipment is needed for these videos. I would recommend investing in a good quality set of weights. We love this Adjustable Dumbbell Set , it goes from 3 pounds to 24 pounds just by changing out the weights. They are easy to change on the fly and it’s a huge space saver versus a traditional set of free weights. Lastly, snag a good quality Yoga Mat that isn’t made out of terrible chemical nonsense that will poison you while you are exercising. We’ve actually been using doubled over blankets instead after a run of buying a few really smelly exercise mats. I just ordered the one in the link today, so I’ll have to report back, but the reviews are good and the listing indicates it doesn’t have Phthalates, Phenols, PAHS, Latex, Silicone or Rubber. Using just a few small gym items and free or inexpensive videos it is totally possible to get or stay fit at home, without wasting loads of time outside the house or money on a gym membership. It’s also much easier to commit to working out most days if you live in your gym space. You can enrich your budgies lives with the extra time out of their cages and the curiosity of you bouncing around like a lunatic while listening to awesome upbeat music! I’d totally love some recommendations for good exercise videos on YouTube or otherwise, so please hit me up if you’ve got anything great to share! You can leave a comment here or drop me a line through Home Keet Home’s Facebook page. Previous Previous post: Introducing Kevin – our third parakeet and first boy! Next Next post: Quarantine is hard! Feeling stretched thin by everyone’s needs.